The following guest blog post is by Nancy Alvarez, a PVF Parent Involvement Worker at Cesar Chavez Academy in East Palo Alto. Education is the means to break the cycle of poverty. East Palo Alto is a community with many newcomers looking for a better future and seeking refuge. Consequently, new families come to the school system who do not speak English. Philanthropic Ventures Foundation (PVF) sponsors a program at Cesar Chavez Academy in East Palo Alto that ensures communication between families and the teachers. In addition to setting up parent and teacher conferences for the families, the program’s purpose is to get parents involved in their child’s education. I have been working with the program, and I have learned the needs of the families. For example, many families do not know how to support the children in school, and perhaps they are not aware of the resources the school and the community offer to help children get to college. I am really inspired by seeing moms sending their kids to college. The program not only focuses on filling the gap in communication, but also on aiding the parents in feeling welcomed in the school and making them feel like a part of their children’s education. PVF’s Bill Somerville (center) and parents at Cesar Chavez Academy in East Palo Alto. These parents are encouraged by Parent Involvement Workers to be active at their children’s school. Bill Somerville, PVF President and founder of the program, designed it to encourage parents to be part of the kids’ education. The mission was to strategically target the problem of miscommunication between families and educators. As of now, the program is a success and has been changing lives. A strong group of moms support the school in all aspects. They are very active in school activities such as raising funds and contributing to school-wide decisions. They are definitely a strong voice for the middle school, for they purposely advocate not only for their children, but for each student. Thanks to PVF, which believes in the power of education, each student has an advocate that makes it possible to fill the gap of communication between educators and parents who are willing to contribute and support the school. 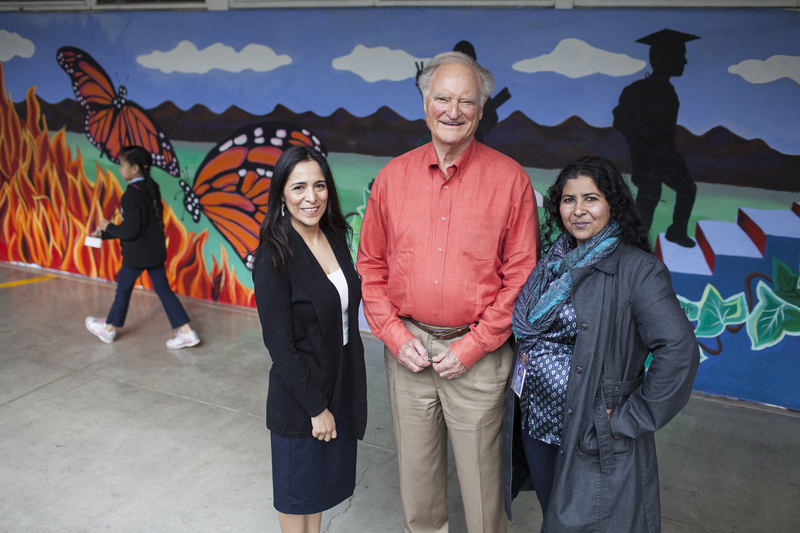 PVF’s Bill Somerville (center) at Cesar Chavez Academy with Parent Involvement Workers Nancy Alvarez (left) and Imelda Jovel (right).